This is one of those books that I've had on my list for quite some time. I do enjoy distopian but I'm more of a contemporary romance type girl so I have to be in the mood for books of this genre in order to read them. Therefore, it took me quite a while to get around to this book. 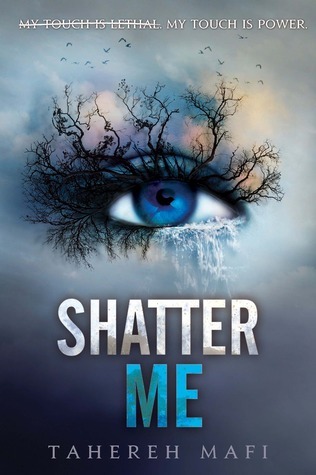 When I signed up for the 2018 TBR Challenge hosted by Roof Beam Reader, I knew that I had to add Shatter Me to the list so that I would finally force myself to get around to it. Unfortunately, as a book blogger, it becomes a habit to put books on the backburner, even ones you've been dying to read. Finally, I dove into the audiobook of Shatter Me and I was super excited to get into it... and then I got into it. This, for me, is the perfect example of 'if you think you don't like a book, try it in a different format'. The audiobook was not a great fit for me. The constant scratching sounds accompanying the story were insanely annoying and the repeated "I am not insane"'s almost drove ME insane. So, I returned the audiobook to my library and checked out a paperback copy. Oh, the difference it made. I dove in again and found myself completely enveloped in Juliette's story. Juliette's character is so broken and rough around the edges that it's hard to not sympathize for her. The world that she has found herself in, as a prisoner, is terrible and the loss of contact she has had with the outside world would be unbearable if I was in her position. And then her world gets completely turned upside down by Adam and Warner. These two characters bring such a crazy mix of action, emotion, and curiosity to the story that, at times, I felt sad, upset, betrayed, and angry for Juliette. The story only got better from there as it became much more action-packed, new characters were introduced, and events starting running full force into a climax. Shatter Me is an amazing, unique story and I deeply enjoyed it's little X-Men twist. I definitely plan to continue the series and I'm excited to find out what happens next.